BNN: Can you share a specific story of his bravery–it sounds like there are many examples to choose from. RW: There are many, both on the battlefield and in the POW camp. On the battlefield, perhaps the most famous is Kapaun brushing aside a Chinese soldier who was about to execute Herb Miller. Miller was lying in a ditch, his ankle broken by a hand grenade. Chinese soldiers were killing many of the wounded. Kapaun, who had negotiated the surrender of some other wounded Americans and himself was a captive at this time, saw this happening. He walked away from his group, brushed aside the befuddled soldier and picked Miller up and put him on his back. He then carried Miller for much of the long march to the POW camp. Miller and his wife, Joyce, attended Thursday’s ceremony at the White House. 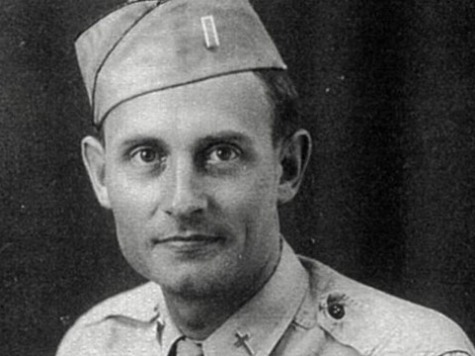 Miller later wept as he held the Medal of Honor won by Kapaun. BNN: Is it common for Army Chaplains to throw themselves in harm’s way as Kapaun did? RW: Certainly not uncommon. Six other chaplains before Kapaun have won the Medal of Honor, all of them for doing the same things in battle that Kapaun did. Soldiers who served with Kapaun, though, said he was shockingly brave, running through gunfire to rescue wounded soldiers while everyone else was ducking for cover. He also won a Bronze Star just after landing in Korea with the 8th Cavalry for leading a group of men in a rescue mission for two wounded soldiers. BNN: Regarding possible sainthood … what can you tell us about the status of this request, and how long has it been in discussion? RW: I think the push for sainthood began in 1953, right after the POWs were released and began telling the story of Kapaun’s bravery and faith in the camp. I think the Army’s chaplain service first took up the cause, but for whatever reason it did not seem to move anywhere. The Wichita Diocese then took over more recently, under the leadership of Father John Hotze, and has made significant progress. A Vatican investigator has made at least two trips to Wichita to interview families and medical personnel involved in possible miracles attributed to Kapaun. One of the miracle families attended Thursday’s White House ceremony. In the summer of 2012, the diocese gathered up all of its documents on its investigation and shipped them to the Vatican. The investigator is finishing his report on the matter, which he will then present to Vatican officials. Yes, I know this photo of him shows him with Lieutenant’s bars, not Captain’s bars. This entry was posted in Honor by Tamquam Leo Rugiens. Bookmark the permalink.